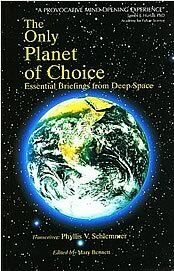 Since its spectacular launch in 1993, The Only Planet of Choice has been widely acknowledged as one of the most significant books for our time. Many of the thousands who have already read it have spoken of the profound effect it has had upon them. This book represents the outcome of over 20 years of work with a distinguished international research group who have communicated with an enlightened circle of universal beings known as " The Nine Principles " The communications continue to this day. The Source have stated that, while other planets do have choice, the consciousness is collective. Only on Earth can a soul experience individual choice. I do hope that you find the ongoing dialogues as helpful in your journey through life as I have found them in mine.